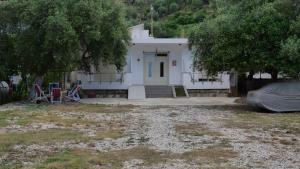 A-HOTEL.com - Luxury and cheap accommodation in Qazim Pali, Albania. Prices and hotel, apartment booking in Qazim Pali and surrounding. Situated in Borsh, Le Monde 1 offers accommodation with a balcony or a patio, free WiFi and TV, as well as a private beach area and barbecue facilities. All units include a fully equipped kitchen, allowing guests to prepare their own meals. Seaview apartment is set in Borsh and offers a garden and a terrace. Guests staying at this apartment have access to a balcony. Hotel Angjelo is located on the beachfront in Borsh. All rooms boast a flat-screen TV with satellite channels and a private bathroom. Providing a garden and free WiFi, Bella Vista offers accommodation in Borsh. Some accommodation includes a kitchenette with a fridge, living room, and a private bathroom with bath. Set in Borsh in the Vlorë County region, Eljudi House has a balcony. This apartment also features free WiFi. Villa Goxhi is located in Borsh and offers barbecue facilities and a garden. Guests staying at this apartment have access to a fully equipped kitchen and a terrace. Located in Borsh, Emili Apartment offers accommodation with free WiFi and flat-screen TV, as well as a terrace. There is also a kitchen in some of the units equipped with a fridge. Hotel Take is offering accommodation in Borsh. Each room is fitted with a balcony. Offering a private beach area in Borsh, Hotel Blue Days features an on-site restaurant, a night club and a bar. Free WiFi access and free private parking are provided. Located in Borsh, Le Monde 2 features a private beach area and a garden. Both private parking and free WiFi are available at the hotel. Featuring a garden and a terrace, Casa Del Mare is located in Borsh. All rooms boast a kitchenette and a private bathroom. Located in Borsh in the Vlorë County region, Emili Vacation home has a balcony. Including a garden, this holiday home also features a restaurant. Situated in Borsh, Hotel Fabio features a garden, bar and free WiFi. All rooms boast a TV with cable channels and a private bathroom. 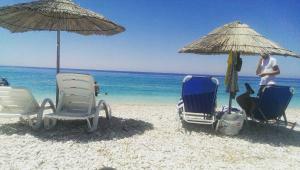 Set in Sarandë, Hermes Apartments Borsh offers accommodation with free WiFi and a garden with a barbecue and sea views. All units come with a balcony with garden views, a kitchen with a fridge, and a private bathroom. Located in Borsh, 47 km from Corfu Town, Guest House Luiza features air-conditioned rooms and free private parking. Each room has a TV. With mountain views, Apartments Blue Paradise is located in Borsh and has accommodation with a kitchenette. A balcony with garden views is offered in each unit. Borshi Tents is located in Borsh and offers a garden and a bar. This tented camp also has a restaurant. Located in Borsh, Villa Nicolas provides accommodation with a kitchen. The apartment offers a terrace. Located in Borsh, Hotel Bar Restaurant Juza features a private beach area. Among the various facilities of this property are a garden and a bar. Hotel Riviera Bed and Breakfast in Borsh provides accommodation with a private beach area, a garden and a bar. Featuring a 24-hour front desk, this property also provides guests with a restaurant.